I mean, c’mon, what purpose do they serve? I realize this might be a shocking idea or make you nervous, but ask yourself—are title slides really necessary? Every slide presentation I’ve ever sat through has always started with a title slide up on the screen. And what’s the problem with that? The problem is that it forces speakers to stand off to the side so they don’t block the screen, which conveys, right off the bat, that the slides are going to be the most important element of this presentation. The screen becomes the all-powerful god for the audience to worship while we stand out of the way. The opening of the presentation is the prime opportunity for speakers to connect with the audience and establish credibility. This is the time we should be setting ourselves up as the primary message-giver. The power position in any room is always the center point upfront. And rooms are staged so that screens are in the center with projectors aimed right at them. Audience chairs are set so they can’t help but look at that center front spot, too. So whatever is front and center will be what the audience will focus on. And at the start of your presentation, shouldn’t that be you? Instead of using a title slide, BE the title slide! 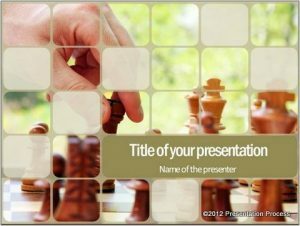 Have a black screen behind you and use the opening of your presentation to set up your topic, objectives, key points, and the audience relevance. Don’t hide behind a lectern or table. Come out from behind the furniture, stand center, make eye contact, and engage the audience. Then, when it’s time to show the first slide of consequence, back up as you click the clicker and stand to one side of the screen as you speak to what it says. Feel free to add a title slide to the handout you give them, just delete or “hide” it for the live presentation. If you like, use a title slide as people enter so they can confirm they’re in the right place. Then go to black as you start speaking. Eliminate the “Thank You” or “Q & A” slide at the end of your programs. Just like the beginning, it’s best to end on another black slide so you can once again be front and center for the Q & A. Do everything you can to have a dynamic start to your presentations. Take that moment in the spotlight for yourself. Don’t let yourself look like an usher in your own movie theater!